"Official" Soviet portrait made of Pavlik Morozov. He is wearing the Young Pioneers red scarf. Pavel Trofimovich Morozov (Russian: Па́вел Трофи́мович Моро́зов; 14 November 1918 – 3 September 1932), better known by the diminutive Pavlik, was a Soviet youth praised by the Soviet press as a martyr. His story, dated to 1932, is that of a 13-year-old boy who denounced his father to the authorities and was in turn killed by his family. His story was a subject of reading, songs, plays, a symphonic poem, a full-length opera and six biographies. The cult had a huge impact on the moral norms of generations of children, who were encouraged to inform on their parents. There is very little original evidence related to the story, much of it hearsay provided by second-hand witnesses. According to modern research, the story (denunciation, trial) is most likely false, although Pavlik was a real child who was killed. Morozov's story was the basis of Bezhin Meadow, an unreleased film from 1937 that was directed by Sergei Eisenstein, as well as the 2015 Latvian film Dawn. The most popular account of the story is as follows: Born to poor peasants in Gerasimovka, a small village 350 kilometres (220 mi) north-east of Yekaterinburg (then known as Sverdlovsk), Morozov was a dedicated communist who led the Young Pioneers at his school and supported Stalin's collectivization of farms. In 1932, at the age of 13, Morozov reported his father to the political police (GPU). Supposedly, Morozov's father, Trofim, the chairman of the Gerasimovka Village Soviet, had been "forging documents and selling them to the bandits and enemies of the Soviet State" (as the sentence read). Trofim Morozov was sentenced to 10 years in a labour camp and later executed. However, Pavlik's family did not take kindly to his activities; on 3 September of that year, his uncle, grandfather, grandmother and a cousin murdered him, along with his younger brother. All of them except the uncle were rounded up by the GPU and sentenced to "the highest measure of social defense" – execution by a firing squad. Thousands of telegrams from all over the Soviet Union urged the judge to show no mercy for Pavlik's killers. The Soviet government declared Pavlik Morozov a glorious martyr who had been murdered by reactionaries. Statues of him were built, and numerous schools and youth groups were named in his honour. An opera and numerous songs were written about him. Gerasimovka's school, which Morozov attended, became a shrine and children from all over the Soviet Union went on school excursions to visit it. During the investigation of Trofim Morozov's case, his wife, Tatiana Morozova, stated that Trofim used to beat her and also brought home valuables received as payment for selling forged documents. According to this testimony, Pavel, who was only 13 at that time, merely confirmed evidence given by his mother. Evidence has emerged since the dissolution of the Soviet Union of the fabrication of the Pavlik Morozov legend. In the mid-1980s, Yuri Druzhnikov, a dissident writer expelled from the Soviet Writers' Union, performed an investigation, met with surviving eyewitnesses, and wrote a documentary exposé about Pavlik. Originally circulated through the samizdat, it was published in Russian in the United Kingdom in 1988 and soon thereafter translated into several languages. The first English translation appeared in 1996 under the title "Informer 001: The Myth of Pavlik Morozov." In his book, Druzhnikov disputes every aspect of the Soviet propaganda version of Pavlik's life. For example, different sources in Soviet literature list different ages for Pavlik at death, and show photographs of different boys. Pavlik was not a Pioneer when he was killed. According to the Soviet version, Pavlik's grandfather was responsible for his murder; according to Druzhnikov, the grandfather was heartbroken about the death of Pavlik, organized the search when the boy went missing, and maintained his innocence during the trial. While not saying it outright, Druzhnikov hints that Pavlik was killed by a GPU officer, whom Druzhnikov met while doing his research. 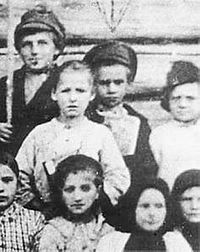 Pavlik Morozov (second row, in the middle): this is the only surviving photograph known of him. In her 2005 book, Comrade Pavlik: The Rise and Fall of a Soviet Boy Hero, Catriona Kelly agrees with Druzhnikov that the official version of the account is almost wholly fictional, the evidence sketchy and based mostly on second-hand reports by alleged witnesses, and that Pavlik did not inform on his parents but was murdered after a mundane squabble. Kelly also shows how the official version's emphasis shifted to suit the changing times and propaganda lines: in some accounts, Pavlik's father's crime was not forging the documents, but hoarding grain; in others, he was denounced not to the secret police, but to the schoolteacher. In some accounts, the method of Pavlik's death was decapitation by saw. The one surviving photograph of him shows a malnourished child, who bears almost no resemblance to the statues and pictures in children's books. It has also been said that he was nearly illiterate and was coerced to inform on his father by his mother, after Pavlik's father deserted the family. Kelly, who had access to the official archives of the case, states that Druzhnikov's theory that Pavlik was killed by the GPU is unlikely. Druzhnikov accused Kelly of extensive plagiarism from his book, and also of "dependence on those who have given her access to archives", i.e. from employees of the FSB – successors of the GPU. Kelly published an extensive reply in Russian in the journal Voprosy literatury. According to the most recent research, Gerasimovka was described in the Soviet press as a "kulak nest" because all its villagers refused to join the kolkhoz, a state-controlled collective farm during the collectivization. Pavlik informed on neighbours when they did something wrong, including his own father who left the family for another woman. Pavlik was not a Pioneer, although he wanted to be one. Kelly believes there is no evidence that the family was involved in the murder of the boy, and that it was probably the work of other teenagers with whom Pavlik had a squabble over a gun. ^ a b c d Orlando Figes The Whisperers: Private Life in Stalin's Russia, 2007, ISBN 0805074619, pages 122–126. ^ С.Костырко, Т.Тихонова. "Журнальный зал – Вопросы литературы, 2006 N3 – Катриона КЕЛЛИ – Без заголовка". russ.ru. Retrieved 8 November 2015. Sloboda, Yamskaya (23 September 2003). "Soviet Hero Pavlik Morozov Still Mysterious". PRAVDA.Ru. Archived from the original on 10 April 2005. "Squalid truth of Stalin's little martyr". History News Network. Center for History and New Media. 27 December 2003. Archived from the original on 14 March 2005.